I honestly have been playing…really, I swear. Work as usual has taken up chunks of my time, as well as other things. And I know I’ve been behind on all of my RSS feeds for the blogs I read when I have over 700 new items >.< To make things simpler, I’m just going to post everything that I’ve been doing on WoW right here. Has reached level 65. 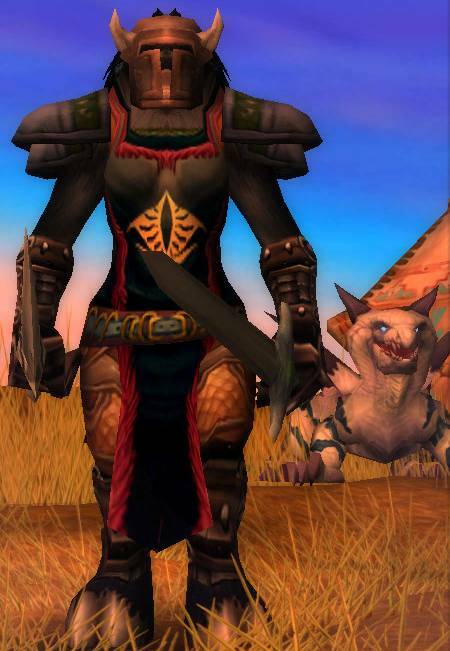 At level 64, she tamed a Warp Hunter who she named Grakoth. 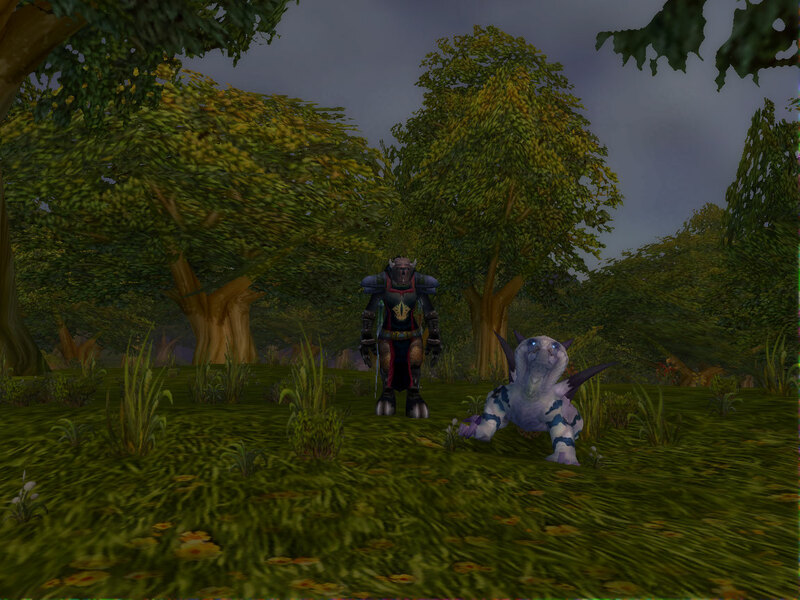 I just took a screenshot of them in Elwynn Forest (because it’s funny to bug the Alliance). Unfortunately it’s night now so the lighting is horrible. Here’s a better picture taken from the character chooser screen. I am loving the Warp ability. Only a 15 second cooldown and it instantly takes Grakoth to the mob…it’s really great for grinding or farming. He’s already up to Loyalty 5 because I’ve quested with him all through level 64. Luckily he likes his fish so it gave me an excuse to work on Niqora’s fishing skill, which is now over 300. And I think he’s just the cutest thing when he tilts his head up and sniffs at the air. It reminds me so much of a dog’s behaviour. Grakoth won’t replace Blacky but he is definitely going to be staying around. Brighit is level 24 as of today. 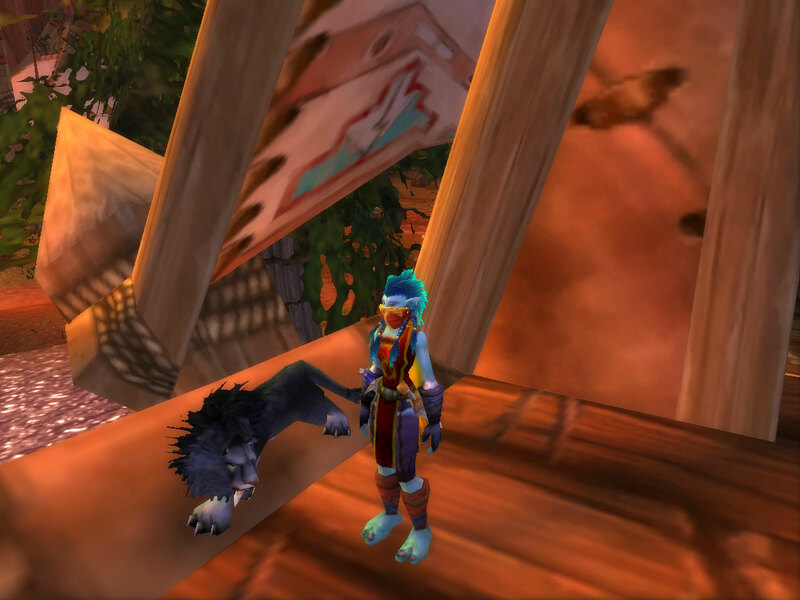 A while ago, she moved to the Moon Guard server to join Wolfrider’s Alliance warlock. He also created a baby NE druid and she’s been waiting for him to catch up so they can level together. Yay! Machalor is level 40 and now my second character to get her mount. Of course, this happens just shortly before the announcement that we might be getting mounts at level 30…*grumble grumble*. Oh well, it will make it easier for my other 7 hunters. After running around all of Azeroth during the Midsummer Festival, she got the 350 flowers she needed to trade them in for a Spirit of Summer, which can be seen next to her in the screenie below. It was quite an adventure that involved a fair bit of dying and dashing through areas that she really shouldn’t have been in. I did try to capture the flame in an Alliance city (Exodar in particular) but it was just too much work so I decided to stick with the little towns instead. 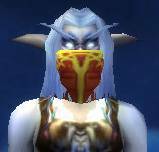 Not much has happened with Fhionn, except that I was bored one day and went around killing the Blood Elf Bandit again until he dropped his wonderful mask. 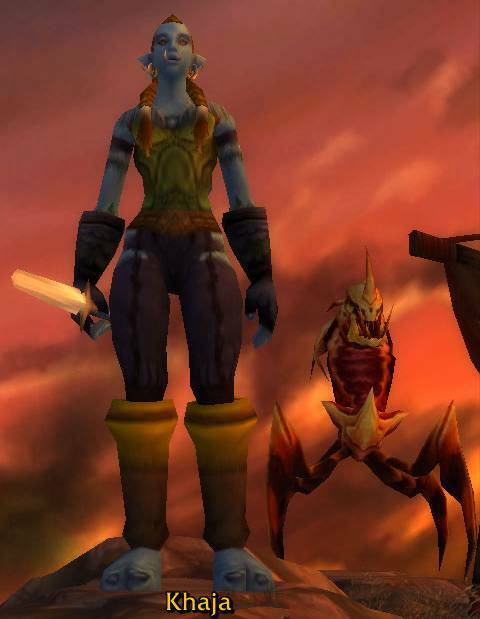 I may or may not be moving her to Moon Guard (she and Brighit are a bit of a team, it doesn’t seem right to separate them like this). Here’s some pictures of Rajesh when his coat was still golden. 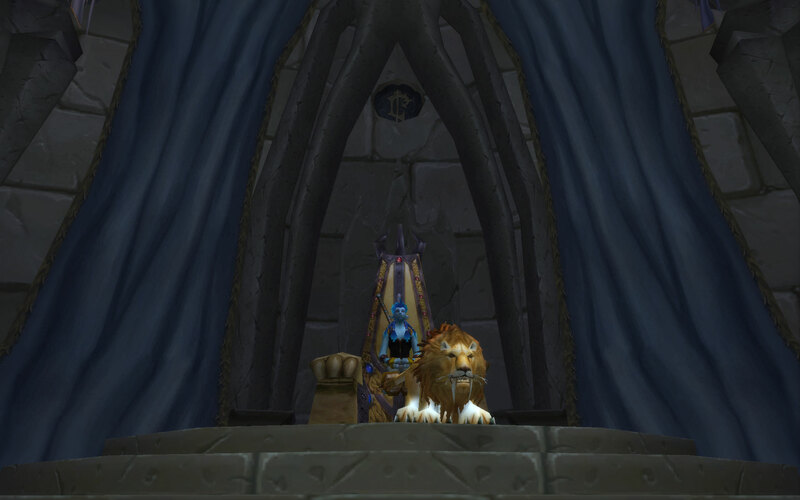 In these screenies, he’s with Tkasha in the old Lordaeron throne room above Undercity. Comments closed — Trackbacks closed RSS 2.0 feed for these comments This entry (permalink) was posted on Sunday, July 13, 2008, at 11:00 pm by Faeldray. Filed in Random Thoughts and tagged Brighit, Fhionn, Khaja, Machalor, Niqora, Tkasha. 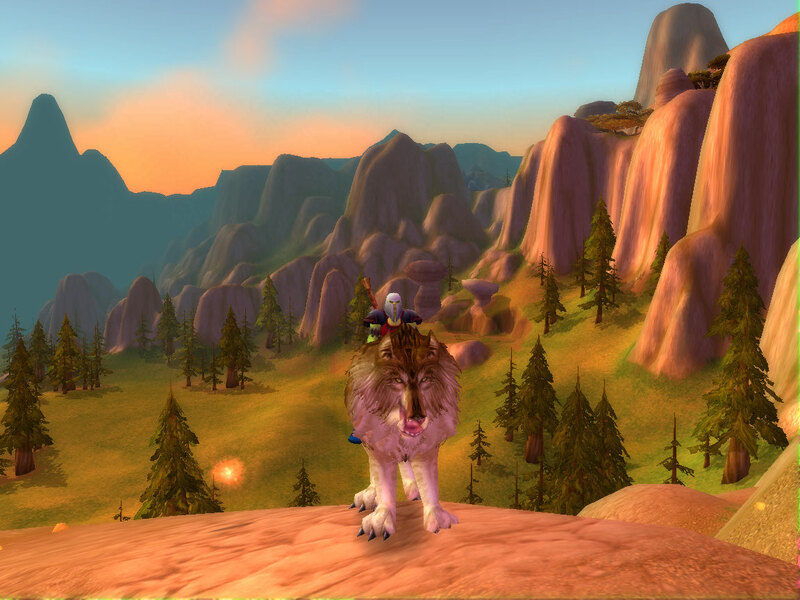 Also, I have a level… 13/14?ish horde hunter on Moon Guard, one of these days I should really send ya a /wave. 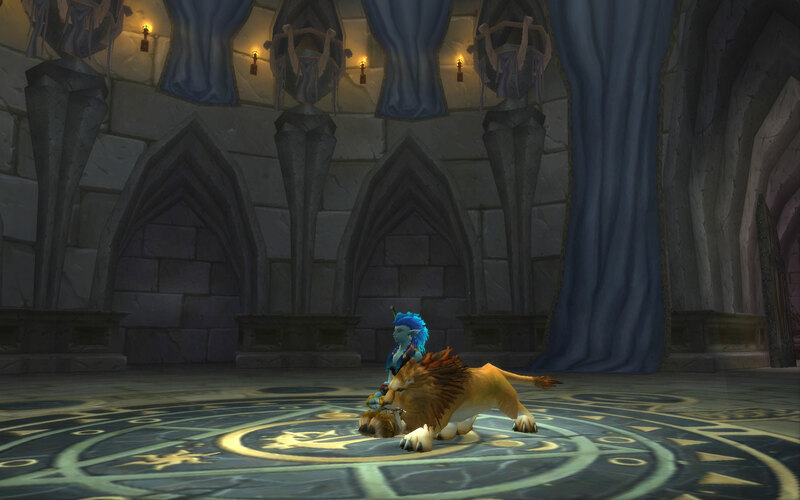 Drotara’s last blog post…Jan’Alai Video Incoming!